. File Photo by NASA TV. 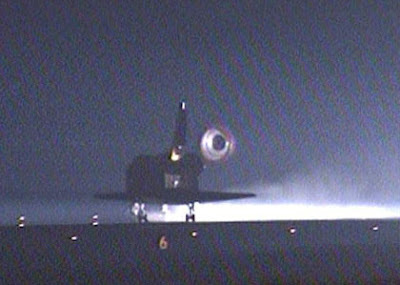 The STS-126 crew members, Commander Chris Ferguson, Pilot Eric Boe and mission specialists Don Pettit, Steve Bowen, Heidemarie Stefanyshyn-Piper, Shane Kimbrough and Greg Chamitoff, were awakened at 4:55 a.m. EST for what is scheduled to be their flight’s landing day. This morning's wake up music was "Gonna Fly Now," played for Ferguson. The two landing opportunities at Kennedy Space Center, Fla., are for 1:19pm EST and 2:54pm EST. Forecasts say rain, perhaps thunderstorms and crosswinds could prevent a landing there. Two additional landing opportunities are available today at Edwards Air Force Base, Calif., at 4:25 pm EST and 6:00 pm EST. Space Shuttle Endeavour and its crew landed at 1:25 p.m. PST Sunday at Edwards Air Force Base in California, completing a 16-day journey of more than 6.6 million miles. The STS-126 mission featured important repair work and prepared the International Space Station to house six crew members on long-duration missions beginning next year. The new station equipment includes a water recovery system, additional sleeping quarters, a second toilet and an exercise device. During four spacewalks, the crew serviced the station's two Solar Alpha Rotary Joints, which allow its solar arrays to track the sun, and installed new hardware that will support future assembly missions. Chris Ferguson commanded the flight and was joined by Pilot Eric Boe and Mission Specialists Donald Pettit, Steve Bowen, Heidemarie Stefanyshyn-Piper, Shane Kimbrough and Sandra Magnus. Magnus remained aboard the station, replacing Expedition 18 Flight Engineer Greg Chamitoff, who returned to Earth on Endeavour after more than five months on the station. Weather concerns prevented the crew from returning to NASA's Kennedy Space Center in Florida, the primary end-of-mission landing site. In 7-10 days, Endeavour will be transported approximately 2,500 miles from California to Florida on the back of a modified 747 jumbo jet. Once at Kennedy, Endeavour will be separated from the aircraft to begin immediate processing for its next flight, targeted for May 2009. STS-126 was the 124th space shuttle mission, the 22nd flight for Endeavour and the 27th shuttle visit to the station. With Endeavour and its crew safely home, the stage is set for the launch of STS-119, targeted for Feb. 12, 2009. Discovery will deliver the final pair of U.S. solar arrays, which will be installed on the starboard end of the station's truss. The truss serves as the backbone support for external equipment and spare components. Lee Archambault will command the 14-day flight that will include four planned spacewalks. Joining him will be Pilot Tony Antonelli, Mission Specialists John Phillips, Steve Swanson, Joseph Acaba and Richard Arnold, and Japan Aerospace Exploration Agency astronaut Koichi Wakata. Wakata will replace Magnus on the station as a flight engineer. Yes... I for one do believe the Iraq War is now won and I could not be prouder of all our men and women in the United States Armed Forces that made it possible. And we all can’t wait until you’re finally home at last! Over the next few days, I’ll be updating this post on Wednesday evening’s unprecedented terrorist attacks in Mumbai, India, so check back! This information is current as of today, Fri Nov 28 11:48:14 2008. The Department of State warns U.S. citizens about heightened security concerns in India, and advises U.S. citizens traveling to or already in India to maintain a high level of vigilance and to take appropriate steps to increase their security awareness. This Travel Alert expires on December 31, 2008. There are heightened security concerns in India following the November 26 terrorist attacks on hotels, a railway station, restaurant, hospital, and other locations in Mumbai frequented by Westerners. Over 100 persons are believed to have been killed, and hundreds injured. Casualties include both Indian and foreign nationals. Americans appear to have been among those specifically targeted. U.S. citizens should exercise caution and take prudent security measures, including maintaining a high level of vigilance, avoiding crowds and demonstrations, keeping a low profile, varying times and routes for all travel, and ensuring travel documents are current. In the aftermath of the terrorist attacks, the Department of State urged Americans to defer travel to Mumbai for at least 48-72 hours. American citizens in need of assistance related to the terrorist attacks should call the Department of State or the U.S. Consulate in Mumbai. Americans throughout India should be vigilant about security at all times. The Embassy and Consulates are actively assessing the countrywide security environment. Americans are advised to monitor local news reports, vary their routes and times in carrying out daily activities, and consider the level of security present when visiting public places, including religious sites, or hotels, restaurants, entertainment and recreation venues. If unattended packages are spotted, American citizens should immediately exit the area and report the packages to authorities. For the latest security information, Americans traveling abroad should regularly monitor the Department's Internet web site at http://travel.state.gov/ where the current Worldwide Caution, Travel Warnings, and Travel Alerts can be found. Up-to-date information on security can also be obtained by calling 1-888-407-4747 toll free in the United States and Canada or, for callers outside the United States and Canada, a regular toll line at 1-202-501-4444. These numbers are available from 8:00 a.m. to 8:00 p.m. Eastern Time, Monday through Friday (except U.S. federal holidays). Americans are also encouraged to read the Country Specific Information for India, available on the Embassy's website at http://newdelhi.usembassy.gov/, and also at http://travel.state.gov/. U.S. citizens living or traveling abroad are encouraged to register with the nearest U.S. Embassy or Consulate through the State Department's travel registration web site at https://travelregistration.state.gov/ibrs/ui/ so that they can obtain updated information on travel and security. Americans without Internet access may register directly with the nearest U.S. Embassy or Consulate. By registering, American citizens make it easier for the Embassy or Consulate to contact them in case of emergency. For additional information, please refer to "A Safe Trip Abroad" found at http://travel.state.gov/. -- The U.S. Embassy in New Delhi is located at Shanti Path, Chanakya Puri 110021; telephone +91-11-2419-8000; fax +91-11-2419-8407. The Embassy's Internet home page address is http://newdelhi.usembassy.gov/. -- The U.S. Consulate General in Mumbai (Bombay) is located at Lincoln House, 78 Bhulabhai Desai Road, 400026, telephone +91-22-2363-3611; fax +91-22-2363-0350. The Internet home page address is http://mumbai.usconsulate.gov/. -- The U.S. Consulate General in Chennai (Madras) is at 220 Anna Salai, Gemini Circle, 600006, telephone +91-44-2857-4000; fax +91-44-2811-2027. The Internet home page address is http://chennai.usconsulate.gov/. -- The U.S. Consulate General in Kolkata (Calcutta) is at 5/1 Ho Chi Minh Sarani, 700071; telephone +91-33-3984-2400; fax +91-33-2282-2335. The Internet home page address is http://kolkata.usconsulate.gov/. a memorable and safe Thanksgiving. I wrote this short story for my family a few years back to bring back the memories of those good old days when we were all so young and the family was everything. God I use to love those good old days at Thanksgiving time. All that good cooking and eating that went on... It's like them days had happened just yesterday!!! I can remember dad driving up to the Big House and all of us kids jumping out of the car and making a dash for the front porch. Just to be pulled back to help unload the car of all the food offerings that we had brought for the Thanksgiving feast. As we walk into the house, we're greeted by hugs and kisses from the Aunts and warm hellos from the Uncles. Smile at Papaw as we walk by and on to the kitchen and out to the back porch we go. After unloading all the food on the tables outside, it's time to go and get a big hug and kiss from Mamaw. .Naturally we would always get the yes ma’am - no ma’am drill from her and after that all of us kids would take off in our own directions. Now as for me -- I usually ran for Uncle Buddy and would jump up into his arms. We'd have a short man to man chat, then it was off to Papaw. Oh yea... That short dash, backward flip to a tail slide across the arm of the chair topped off with a good 10 point landing... down between the side of Papaw and the arm of the chair. Such perfection... I'd even managed to miss that big old cigar that was always in Papaw's mouth. "Hey Papaw.... Got you any wolves this week???" I sure did love getting up in that chair with Papaw. All the small talk that went on between us that only Papaws and their grandchildren can have and the smell of Papaw's cigar... Now how can any of us forget that!!! After a short visit with Papaw, I would run through the house to see what all the cousins were up to. Shoot... It always seemed that by the time we could all get together and get some kind of game started, all through the house you would hear Mamaw calling... "Everyone come to the table- it's time to eat." Now you would think that all us kids would come a running!!! 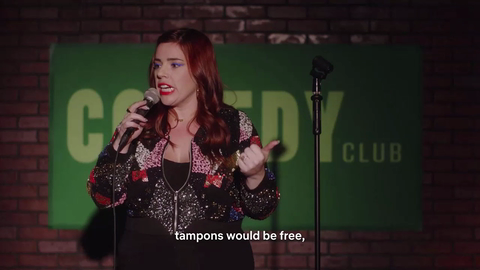 Well some of us would, yet some of us would not. Yes sir, some of us kids were a little hard headed. Figure that!!! We would give ourselves them excuses like... "If we hurry up -- we can finish this game and then go eat." This never did work out, no matter what we were playing. A few minutes would pass by, then someone would come for us bringing major threats from our parents. Hard headed are not, we knew for our own self preservation it would be best to make a dash for the tables about this time. After everyone got settled down in their chairs it would start to get real quit. That's because before we could all start eating we had to have prayer. There was always some praying going on but it was more on the lines of: "Lord, please don't let Aunt Alice say the prayer this year." Mother wouldhave the food cold by the time she got done with the Thanksgiving Blessings. Yes sir... That women could sure do some praying at the table!!! Anyway, I truly hope that this short story has sparked a few fond memories in all of you and I'll end with this wish... May you and yours have a wonderful and memorable Thanksgiving and for god’s sake… don't burn the rolls this year! 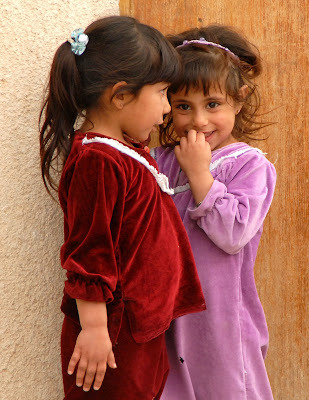 Iraqi girls stand together outside of their home in Tunis, Iraq, on Nov. 20, 2008. Master Sgt. Anthony Davis, 43, of Deerfield, Fla., died November 24th in Baaj, Iraq, after being shot by an Iraqi Security Force soldier while he was conducting a dismounted humanitarian food drop. He was assigned to the Military Transition Team, 1st Brigade, 1st Infantry Division, Fort Riley, Kansas. The circumstances surrounding the incident are under investigation. Mumbai, India came under a series of unprecedented, well coordinated terrorist attacks Wednesday evening that left over 80 dead at last count, 240 or more injured and some people were even taken hostage. Fires broke out from the destruction in several of the high profile targeted areas that included two hotels, the landmark Taj Hotel at the Gateway and the Oberoi Trident Hotel at Nariman Point, the domestic airport at Santa Cruz, the Cama and GT Hospitals, the Metro Adlabs multiplex and the Mazgaon Dockyard. It’s also being reported this evening that a little known group calling themselves the ‘Deccan Mujahideen’ is claiming responsibility for the attacks. We strongly condemn the terrorist attacks that have taken place in Mumbai, India. Our sympathies go out to the families and friends of those killed and injured, and to the people of Mumbai. We are monitoring the situation very closely and stand ready to support the Indian authorities as they deal with this horrific series of attacks. At this point, we are unaware of any American casualties. * Photo for the Day * Iraqi national policemen from the 2nd Battalion, 7th Brigade, 2nd NP Division, Civil Affairs Team, gather with Iraqi children from an elementary school in the Doura community of southern Baghdad Nov. 20. 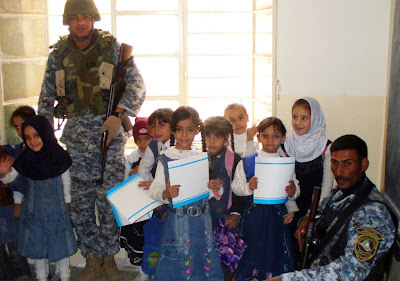 The NPs are part of a freshly formed CA Team created by Soldiers from Company D, 404th Civil Affairs Battalion, attached to the 1st Special Troops Battalion, 1st Brigade Combat Team, 4th Infantry Division, Multi-National Division - Baghdad. Iraqi National Police Strive to Serve, Protect Baghdad's Residents . 1st Lt. William K. Jernigan, 35, of Doraville, Ga., died November 24th in Baqubah, Iraq, of injuries sustained from a non-combat related incident. He was assigned to Headquarters Company, 1st Stryker Brigade Combat Team, 25th Infantry Division, Fort Wainwright, Alaska. The circumstances surrounding the incident are under investigation. Capt. Warren A. Frank, 26, of Cincinnati, Ohio, died November 25th while supporting combat operations in Ninewa province, Iraq. He was assigned to the 5th Air Naval Gunfire Liasion Company, III Marine Expeditionary Force, Okinawa, Japan. The FBI’s fight against terrorism funding paid a big dividend yesterday when five former leaders of a U.S.-based Muslim charity were convicted of funneling more than $12 million to the Palestinian terrorist group Hamas. 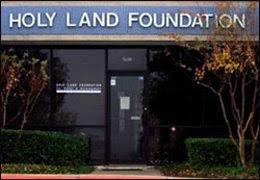 > About Photo: Holy Land Foundation office in the Dallas, Texas suburb of Richardson in 2001. Guilty verdicts on all 108 counts against the Holy Land Foundation for Relief and Development were announced in federal court in Dallas, Texas, representing the largest victory against terrorist financing in the U.S. since the 9/11 attacks. “For many years, the Holy Land Foundation used the guise of charity to raise and funnel millions of dollars to the infrastructure of the Hamas terror organization,” said Patrick Rowan, Assistant Attorney General for National Security. “This prosecution demonstrates our resolve to ensure that humanitarian relief efforts are not used as a mechanism to disguise and enable support for terrorist groups. 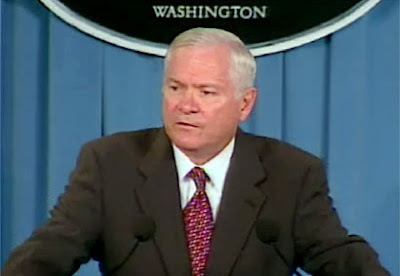 The FBI first got involved in the Holy Land case nearly 15 years ago. In 1994, we began looking into the organization’s financial ties to Hamas. During the investigation, our agents traveled the globe to conduct more than 100 interviews, to sort through hundreds of boxes of documents (including many Arabic documents), to view hundreds of video and audio tapes in Arabic, and to review thousands of pages of bank records. 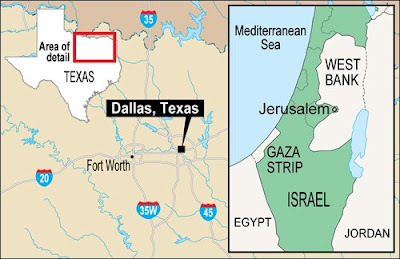 > About Image:The Holy Land Foundation, based in a Dallas suburb before it was shut down in 2001, provided about $12.4 million in funding to Hamas-controlled organizations in the West Bank and Gaza. Fighting terrorism by choking off its funding source is one of the many techniques we use to proactively disrupt and dismantle terrorist enterprises before they strike. The case against Holy Land was investigated by one of our Joint Terrorism Task Forces, which bring together local, state, and federal law enforcement agencies. In December 2001, three months after the 9/11 terrorist attacks, the U.S. Treasury Department designated Holy Land as a “Specially Designated Terrorist” group. We raided the organization’s Texas headquarters, seized its assets, and shut down its operation. At the time, Holy Land was ranked as the country's largest Muslim charitable organization. Hamas was designated a terrorist organization by the U.S. in 1995, and that made contributions to the group illegal. The 108 counts the Holy Land defendants were convicted of yesterday, including providing material support to Hamas and money laundering, carry stiff sentences. No sentencing date has been set. During the trial, the government presented evidence that Holy Land Foundation and the five defendants provided approximately $12.4 million in support to Hamas and its goal of creating an Islamic Palestinian state by eliminating the State of Israel through violent jihad. Evidence was also presented that several of the defendants have family members who are Hamas leaders, including Hamas’s political chief, Mousa Abu Marzook. Image above: STS-126 Mission Specialist Steve Bowen works outside the International Space Station during the mission’s fourth spacewalk. Steve Bowen and Shane Kimbrough ended their mission's fourth spacewalk Monday at 7:31 p.m. EST. The excursion lasted six hours and seven minutes. They worked on the starboard and port solar alpha rotary joints, installed a camera on the Port 1 Truss and installed a GPS antenna and retracted a latch on the Kibo laboratory. Inside the station, the other shuttle and station crew members completed maintenance on the Water Recovery System's Urine Processor Assembly (UPA) and started another processing cycle. Engineers hoped that the maintenance performed would enable the UPA to run for its full four-hour processing time. In addition, the Space Shuttle Program Mission Management Team formally approved extending STS-126 by one day. The STS-126 mission was extended so the astronauts could continue troubleshooting the International Space Station's new Water Recovery System. The crews of the International Space Station and Space Shuttle Endeavour now will spend Thanksgiving Day together, and the shuttle will undock on Friday. Space Shuttle Endeavour's Landing is now targeted to take place at the Kennedy Space Center's Shuttle Landing Facility at about 1:18pm EST, Sunday. Sgt 1st Class Miguel A. Wilson, 36, of Bonham, Texas, died November 21st in Abu Sayf, Iraq, of injuries sustained during a rescue attempt of another soldier while their unit was conducting a dismounted reconnaissance mission. He was assigned to the 2nd Squadron, 3rd Armored Cavalry Regiment, Fort Hood, Texas. The incident remains under investigation. For more information media may contact the Fort Hood public affairs office at (254) 287-9993 or 254-287-2520; after hours (254) 291-2591. ...Booths, exhibits, demonstrations and information sessions were the buzz inside the Shreveport Convention Center this past Friday for the first Haynesville Shale Expo that was held from 1:15pm to 7:00pm. 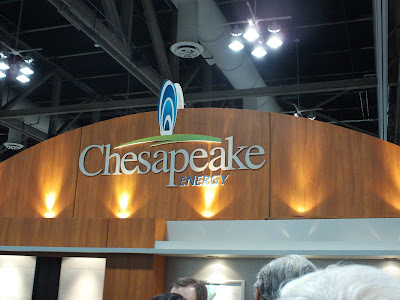 This HUGE event was hosted by the City of Shreveport and presented by The Shreveport Times and the energy companies -- Chesapeake, Devon, EnCana, Petrohawk and XTO. Regional Chambers of Commerce also served as hosts. Now... for those of you who are not from the local area and would like to know a little bit about what all the fuss is about over this Large Natural Gas Deposit... here’s a little inf0 on the Haynesville Shale just for you. For one... The Haynesville Shale is one of the richest fields of natural gas ever discovered in this part of the country and some have said it could be the 4th largest natural gas field in the world. Only time and a lot more drilling will tell for sure and as one of the many land owners, I... along with many others... can’t wait to know the final verdict! Most all of the Natural gas production from the Haynesville Shale occurs within rocks about two miles down... underneath northwestern Louisiana, southwestern Arkansas and eastern Texas. Although the gas field covers about eight parishes in the northwestern part of Louisiana, the most productive areas thus far have been in Bienville, Bossier, Caddo, DeSoto, Red River and Webster Parishes plus a few adjacent areas in southwestern Arkansas and east Texas. STS-126 Mission Specialists Heidemarie Stefanyshyn-Piper (left) and Shane Kimbrough work together during the mission's second scheduled spacewalk as construction and maintenance continue on the International Space Station. 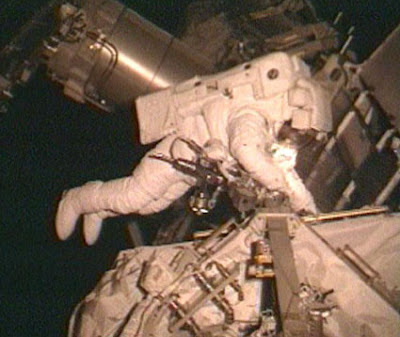 During the six-hour, 45-minute spacewalk, Piper and Kimbrough continued removing debris and applying lubrication around the starboard Solar Alpha Rotary Joint, Joint, replaced four more of the joint's 12 trundle bearing assemblies, relocated two equipment carts and applied lubrication to the station's robotic Canadarm2. The Crew of Space Shuttle Endeavour STS-126 has been on a 15-day mission to expand and improve the Space Station's living area and is scheduled to return to Earth on November 29th. 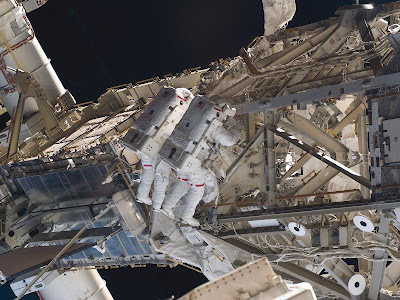 Note: Shuttle Astronauts Steve Bowen and Shane Kimbrough prepared Sunday for the mission’s fourth and final Spacewalk that is set to start at 1:45pm EST Monday. 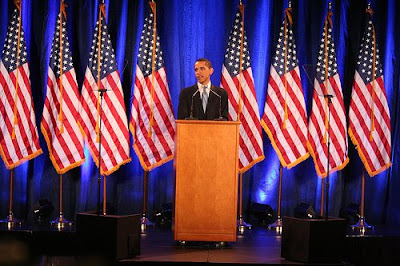 Hamas Has Secret Ties with Obama!!! ?